Mr. Coyer has spent years earning a solid reputation among judges, attorneys, and members of law enforcement throughout the community. His primary areas of practice include criminal defense, personal injury, and medical malpractice. Gregory E. Coyer attended the University of Texas at Austin, graduating with a bachelor’s degree in Government and Business Administration. After college, Mr. Coyer worked as an intelligence analyst for a private consulting firm, whose clients included government intelligence agencies, defense contractors, and aerospace engineering companies. This experience provided rare and valuable insight into global politics and helped shape his worldview. 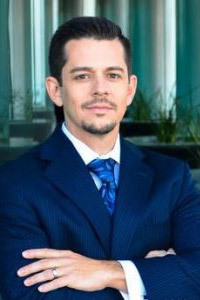 Ultimately, Mr. Coyer determined that his passion was justice and decided to attend law school, enrolling at the University Of San Diego School Of Law. Developing a unique talent for courtroom advocacy, in his first year of legal study, Mr. Coyer was recognized as “Best 1L Advocate” in trial competition. During his time in law school, Mr. Coyer also had the privilege of gaining valuable hands-on experience working directly with the gifted trial lawyers at Thorsnes Bartolotta McGuire. After law school, he relocated to Las Vegas where he has practiced law for nearly a decade. A member of the Nevada State Bar and Nevada Attorneys for Criminal Justice, Mr. Coyer has spent years earning a solid reputation among judges, attorneys, and members of law enforcement throughout the community. He prides himself on utilizing the strength of those relationships to achieve the best possible results for his clients. His primary areas of practice include criminal defense, personal injury, and medical malpractice.